I hate to admit it, but I’m not a big salad fan and I’m pretty picky about salad dressings. One of my goals for this year is to eat more raw foods and so I’m trying some new things to help dress up plain salad. 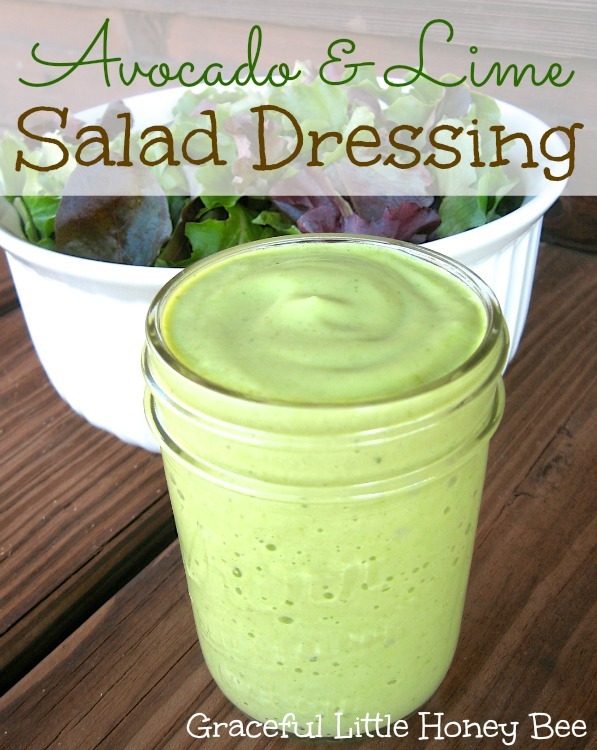 This Avocado & Lime Salad Dressing is seriously so good! It’s fresh, healthy and full of flavor. The garlic will give you some strong breath so beware. I also tried it on rice, but I actually like it on the lettuce better which I didn’t expect. I think I’m hooked on homemade dressing. It was so easy to make! Have you ever made homemade dressing before? How do you dress up your salads? I’d love to know! Cut avocado in half, remove pit and squeeze the insides into a blender. If it doesn't come out easily then your avocado probably isn't ripe enough. Blend until smooth and creamy. You may want to adjust the amount of water depending on how thick you want it. It is good! You will love it! I've got some ripe avocado that needs used up immediately - and this sounds like an amazing recipe - thanks for sharing! I just started making my own salad dressings and love trying new recipes...this one will be next! This sounds absolutely delicious! I love salad dressing with a little zip to it! Wow! Avocado and lime…two of my favorite flavors. :-) Will definitely be giving this a try, and hopefully it will make me enjoy a salad more often! This looks so good, but then you can't go wrong with avocado! The color is so enticing! This salad dressing sounds super yummy, I can't wait to try it. I love salad and I prefer homemade dressing. Thanks so much for sharing this, Missy. It looks delicious. Pinning! How long can this be kept in the fridge to be usable, do you think? I would say you should eat it within 3 or 4 days. This looks so good! I think my husband would love this dressing! Hi Missy! This dressing looks delicious! Definitely making some in the very near future:) Yum! Do you refrigerate these salad dressings? Yes, it needs to be refrigerated.